August’s dividend income number is fantastic, but net worth dipped a bit as the bill on our final home improvement project came due. 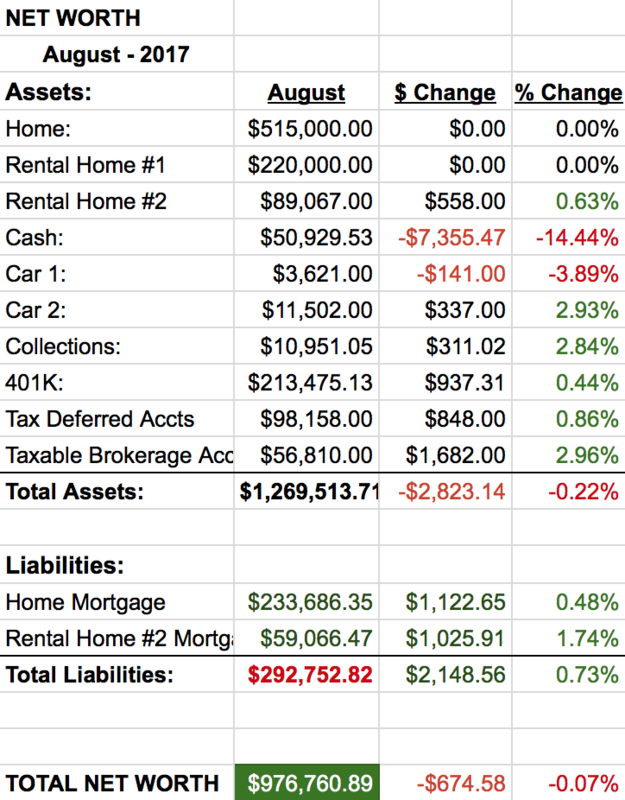 As I’m sitting here writing this post on an airplane, I’m afforded some extra time to write about this dividend income and net worth report. I’m going to edit the format of this post up a bit as there are some pressing health things that are weighing on my mind. August has been a crushing month for dividend income. I can’t tell you how excited I am about this month’s dividend increase. This month I received $464.21 in dividend income. On average, I was paid $19.34 from a 23 fantastic companies. I love having 23 passive income jobs with some of the best run companies in the world! We once again have a huge monthly dividend income increase. This month’s dividend income is a 150.64% increase over August 2016. This size of increase will allow me to reach my goals. 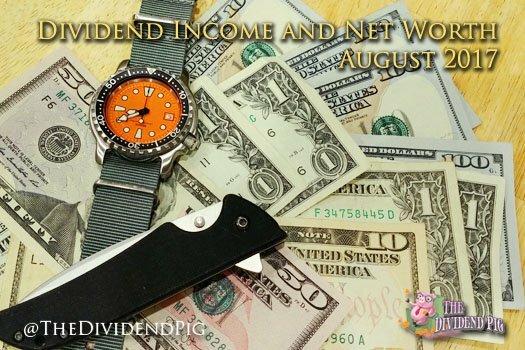 August’s dividend income covers my: cell phone, electricity & gas bill, internet and some of my car insurance. Cash took a big hit this month which caused a slight dip in net worth. As you may have noticed there is a large double digit, red percentage next to cash. It isn’t pretty. However, the work the money was used for made our house look great. We had our house painted and it cost us just about $7,500. I realize, it’s an insane amount of money for a somewhat superficial job. Though, it had been on our to-do list since the day we purchased our house almost 8 years ago. It’s impossible for me to justify the expense as paint was peeling and wood wasn’t rotting away. But, our house now looks like one of those fancy HGTV houses that has just been flipped. I’m just not selling our primary home… yet. We have some big news. We’ve decided to sell rental property #1. It’s been a busy few weeks trying to get the place ready for sale after our tenant moved out last month. In an effort to get our place to sell quickly and high, we decided to put in some work and try to match the condition and furnishings to the most recent record breaking sale in the building (almost 250k). My wife and I painted the unit and we purchased new stainless appliances for the kitchen, new countertops with new sinks for the kitchen and bathrooms and updated the lighting throughout the unit. The total of all these upgrades will come out to roughly $7,500. Hopefully, we’ll see this money returned to us in spades when it’s time to sell. Before placing the unit on the market, we’ve already had an as is offer for a bit under 210k. It will be interesting to see what these upgrades will do to the price once on the market. If we are able to get 250k for the unit, we’ll be able to pay off our home even with realtor commissions. Obviously, I’ll keep you posted. The time has come again for my wife to go back under the knife for surgery. As you may remember, my wife had surgery 1.5 years ago. The surgery was a great success and we learned that the worst-case scenario was thankfully not our situation. However, we did learn that she has something called Endometriosis (stage 4) with endometrioma. Endometriosis is a painful disease that causes inflammation and tissue to grow in places it shouldn’t on the uterus and elsewhere in the body. Unfortunately, there is no cure for the disease, it can only be loosely treated with drugs (a prostate cancer drug is popular) and the somewhat occasional surgery to clean off the infected spots. We have learned that she may have some adhesions and endometriosis on her bowels that might require some of her intestines to be excised (cut out). It’s a big deal and adds an extra level of complication to the laparoscopic surgery. There are also some hefty costs involved with these procedures. At best, we will again max out our family deductible ($5,000) – at worse, it could cost us up to 15k. We’ve already had to come a thousand dollars out of pocket for an MRI. A colonoscopy is the next procedure and that won’t be free. While I bring up the costs of the procedures, I will pay whatever the cost to ease my wife’s pain. Fortunately, we have insurance (albeit not very good) and have found a great surgeon who takes our insurance. It is a thrilling time as I’ve never sold a house before and I suspect I’ll learn a lot. Hopefully, our instinct to upgrade the unit will come through for us. On the dividend income side, I’m making some nice gains and have been putting a lot of money to work. Last month investing surpassed $20,000! Those investments should pay dividends for a long time. However, all of that stuff means nothing without health and happiness. On the general market side, I’ve been reading a lot about a potential North Korea dip coming. I certainly don’t want the USA or rest of the world engaged in any war, especially a nuclear war (God help us). However, we may be able to reap some rewards and pick up some bargains if markets corrects while cooler heads prevail. I’ve got the cash ready to go and sending up prayers for peace just in case. Congrats on the big jump in dividend income year over year! And don’t worry about that big negative in the cash column. I’m sure you’ll reap the rewards when the place finally gets sold. I hope so! Still waiting on everything to get delivered, so it looks like its going to be at least another few weeks before we find out. Awesome job 23 companies paying you and it will continue to grow and grow. Love the ATT hope i can eventually get mine up there. Keep it up. Thanks! Did you pick up any T when it went on sale last week? Congrats on the great dividend income. Hopefully this surgery is as successful for your wife as the last one. As always, great to hear from you! Sorry to hear about your wife, I hope all works out. Why are you selling rental #1? Is there a reason? Are you finding the headache not worth it? Thanks Evan, I’m sure all will be well a month or two after the surgery. We are selling rental #1 for a couple of reasons. The return on this property is pretty poor – roughly 3%. The unit wasn’t purchased as a rental, and I paid way too much for it. We are already at the top of the range in terms of rent – so we are kind of stuck there. Our long-term tenant has moved out and units in the building are now selling very well! It seems like a great time to strike. I also like the idea of using the cash from the sale to pay off our mortgage. That would also free up a lot of cash monthly to invest. Being mortgage free sounds very exciting!